Surgeon training is a significant undertaking for both the learner and the teacher. To first do no harm, trainees spend countless hours learning to become competent and safe. The means to this end however has significant limitations. The cliché of see one, do one, teach one grossly oversimplifies the acquisition of a surgeon’s skill, is actually unethical and requires elaboration. Resident Work Hours: Are We Looking at the Right Metrics? Residency training can be divided into two separate skills. Book smarts and technical ability. These are not mutually exclusive and require exposure to lectures and the operating room. Although residency work hours have changed in North America and Europe, the challenge among educators has always been the same. How to increase a trainee’s surgical exposure, allow them independence in the operating room and build their confidence without compromising patient care? See one, do one, teach one grossly minimizes the art of learning surgery. Surgery, like any activity, is a combination of mental and physical expression. Using cadavers and sawbones, although limited, is the exact model which requires critical evaluation. How much mental preparation goes into using a saw bone to learn surgery. Is it similar to using a broom stick to practice your golf swing? So the question remains, how does one become an expert in our current training model? How should we learn in 2018? We can’t all be experts, or can we? A hallmark characteristic of a surgeon expert includes a refined clinical decision-making ability with a learned level of technical skill. Their expertise developed through case volume and lessons learned from those procedures. Every mistake became a critical learning point which made them better, more experienced and eventually an expert. This mode of learning is central to the work of Psychologist Anders Ericsson. Improving performance towards expertise is achieved through diligent self-assessment and repetition referred to as “deliberate practice”. How then does the surgeon trainee become the technical expert? Increasing volume is a well-documented approach to improving performance. All stakeholders are interested in approaching this problem head on through course offerings. The intention being to minimize complications. But how do you avoid complications if you don’t understand what you have to do to cause them? Is it a hand gesture, a misplaced retractor? Making errors when associated with reflection, deliberation and then followed by “repetition” offers the most efficacious means towards improving technical performance. But where or whom shall we practice these skills upon. How should we learn in 2018? We can’t all be experts, or can we? With the inception of virtual reality (VR) and the introduction of immersive technologies in medicine, there is incredible enthusiasm for the potential to answer the above question(s). If we perform virtual surgery, perhaps we’ll all be experts. 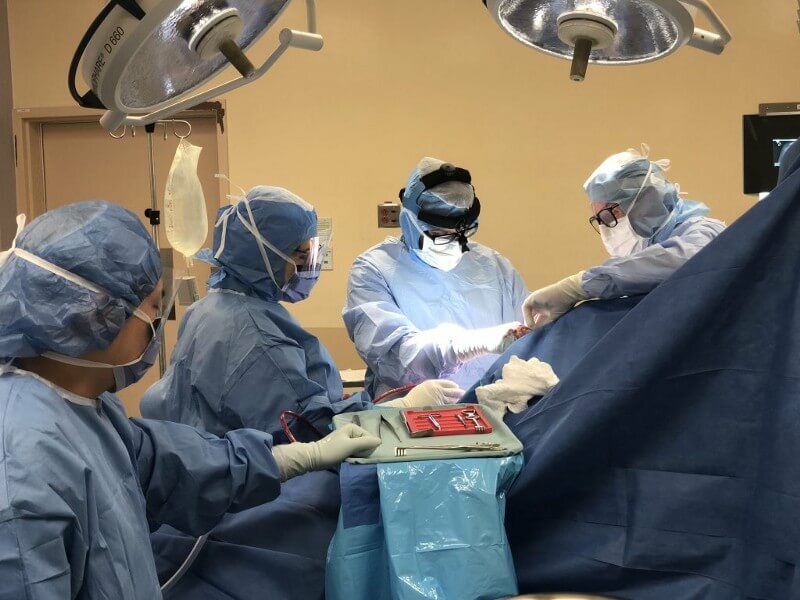 Virtual reality may provide a medium whereby surgeons and trainees can improve their surgical skill, make decisions and realize their outcome while performing a significant volume of virtual cases. Although considerable excitement has been generated for virtual reality, one must proceed with caution. To avoid a misguided introduction of this valuable technology, stakeholders must evaluate this tool with a thoughtful and considerate approach in providing the greatest benefit to our users and ultimately our patients. There is a real opportunity to “bend” the experience curve for all types of procedures. To allow virtual mistakes, permit provocation and repeat. On a larger scale, the impact on the health care system and potential to provide value-based care may be within reach. With a patient centered approach, surgeons may truly improve outcomes if a thoughtful and carefully considered introduction of this powerful technology is implemented. To simply focus on the,” do one” portion of learning, would be a catastrophic under utilization of this potentially “game changing” technology. A mindful, evidence based, truly validated and considerate approach will be important to all stakeholders interested in improving our current state of affairs. Surgery, like any activity, is a combination of mental and physical expression. The Dalai Lama remind us that the time of greatest gain in terms of wisdom and inner strength, is often that of greatest difficulty. Challenging our users in virtual reality, formulating a thought, making a decision and realizing the outcome of that decision provides the greatest impact to not only surgical trainees but skill acquisition in any domain. It may be that we are in an era of immersive technology which provides a medium similar to the operating room. The potential to provide the learner an opportunity to learn from their mistakes, objectify their performance and minimize patient harm may be closer then we think. Precision OS Technology is a software company positioned to positively impact Orthopedic surgery with their high-fidelity VR software platforms. Our focus on the critical elements of surgery, haptics, and metric feedback provides for an unparalleled educational experience. In addition, our pre-operative planning tool eliminates the trial and error associated with fracture care through an immersive interaction with patient images.